International rating agency Moody’s Investors Service yesterday said the political crisis unfolding in Sri Lanka with the sudden appointment of former president Mahinda Rajapaksa in place of Ranil Wickremesinghe is credit negative for the sovereign. In a shocking move, President Maithripala Sirisena appointed the former strongman Rajapaksa to the premiership last Friday, sacking Wickremesinghe from the post and prorogued Parliament till November 16. 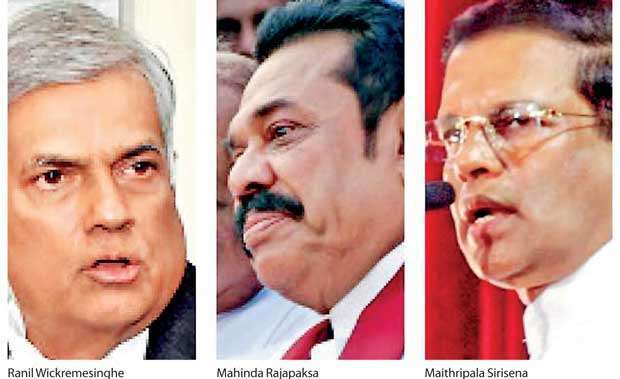 However, Wickremesinghe is still clinging on to his post and has not vacated Temple Trees, Prime Minister’s official residence, claiming the new appointment is unconstitutional and he still can show the majority support in the 225-member assembly.Parties supporting Wickremesinghe yesterday urged the Speaker to reconvene Parliament to put the current impasse to rest. “The current political crisis in Sri Lanka is credit negative for the sovereign. The president’s sudden appointment of Rajapaksa as Prime Minister significantly heightens policy uncertainty,” said Moody’s Sovereign Risk Group Analyst Matthew Circosta. Moody’s maintains a speculative grade ‘B1’ rating with a ‘Negative’ outlook on Sri Lanka due to the sovereign’s high government debt, very low debt affordability and fragile external payments position. A former deputy governor and political and economic commentator Dr. W.A. Wijewardena yesterday called the current situation in Sri Lanka as “unprecedented in the history of Sri Lanka” and said “whatever its outcome, it has far-reaching social, political and economic consequences”. In his weekly column to our sister paper Daily FT, he said among other things the economy would be the main casualty and urged the parties to resolve it quickly or perish as the economy is already in a fragile state with growth at its lowest, weak external sector and unmanageable budget leading to more borrowings and money printing by the Central Bank. “Additionally, the possible social tensions that may unfold in the next few weeks would have a negative impact on the economy, which is already growing slowly,” Circosta said expressing similar sentiments. As the planned budget for November 5 is in disarray, it is highly expected that the new populist government led by Rajapaksa to announce a raft of concessions to the people on November 16, when Parliament is re-summoned, to remain popular until the next parliamentary polls. Such action would certainly throw away the government’s medium-term fiscal consolidation agenda eroding investor confidence. “And at a time when global financial markets are turbulent, uncertainty about the direction of future policy could have a large and lasting negative impact on international investor confidence. Such a development would undermine Sri Lanka’s ability to refinance the forthcoming external debt in early 2019 at affordable costs,” Circosta said. The business chambers operating in the country yesterday urged the political authorities to resolve the issues through democratically established institutions as early as possible, as the current political uncertainty could have adverse consequences to the country, if it remains unsolved. “We request the political authorities to resolve the issues through the democratically established institutions as early as possible. We appeal to the political parties to ensure that law and order prevails and that danger to the life and property of citizens is prevented. All parties should act in the best interests of our country, our people and the national economy,” joint chambers of commerce said in their statement. The joint chambers include the Ceylon Chamber of Commerce, Chamber of Construction Industry Sri Lanka, Chamber of Young Entrepreneurs, Federation of Chamber of Commerce and Industry Sri Lanka, Joint Apparel Association Forum, National Chamber of Commerce of Sri Lanka and National Chamber of Exporters of Sri Lanka.